Soften yeast in warm water. Scald the milk and cool to lukewarm. Add the yeast mixture, 2 tablespoons of the sugar and 2 cups of the flour. Beat until smooth. Let rise until light and full of bubbles. Cream the margarine with the rest of the sugar, beat in the eggs, add salt and stir into the yeast mixture. Add raisins and enough flour to make dough easy to handle. Knead until smooth. Let rise until double in bulk. Shape into round buns and place about 2 inches apart on greased cookie sheet. Brush tops with melted shortening. Let rise again until double in bulk. 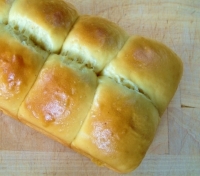 Cut a cross into the top of each bun. Bake in a 400° oven for 15 minutes. Fill the lines of the cross with icing made from blending the powdered sugar with the egg white. Makes 3 dozen buns. Recipe categories: For large groups, < 15 mins, Weeknight.